The 308 Winchester is one of the most popular long range rounds you will find. With less kick and lower ammunition prices than many other 30 caliber rounds, the 308 Winchester is the perfect round for your hunting needs. Proven through years of military and law enforcement use, as well as extensive hunting and match shooting applications, the 308 deliver long range performance. 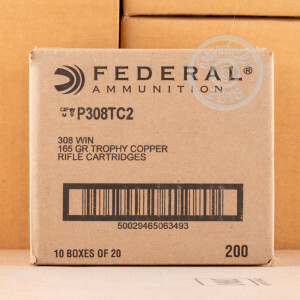 Since 1922, Federal Premium has been putting out the ammunition the American people need. Whether you hunt, match shoot, or need personal protection, Federal is there. 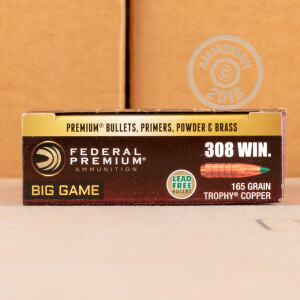 These Trophy Copper rounds feature lead-free polymer tipped projectiles that provide deep penetration and 99% weight retention. 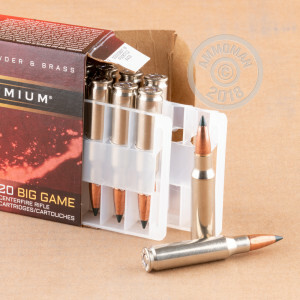 These 165 grain projectiles are loaded into fresh nickel-plated brass cases that come boxer primed and are re-loadable. With these Vital-Shok rounds you have the energy, accuracy, and terminal performance you need to take down boar, deer, and even elk. Remember, at AmmoMan.comall orders over $99 will receive Free Shipping!